This is a guest post by James Spittal, who is an Entrepreneur and Web Marketing Consultant in Melbourne, Australia. He is the founder of Merspi for VCE Students and the Lean Startup Melbourne group. He is also the Managing Director of Fast Fast Websites which provide lean web marketing solutions to small businesses. You can follow him on Twitter at @jamesspittal or on Facebook. Taking yourself as the target market for your business venture puts you in a position of power and true understanding — knowing their real pain points and being able to relate to the customer is a real competitive advantage and often a good starting point for the solo, bootstrapping Entrepreneur. 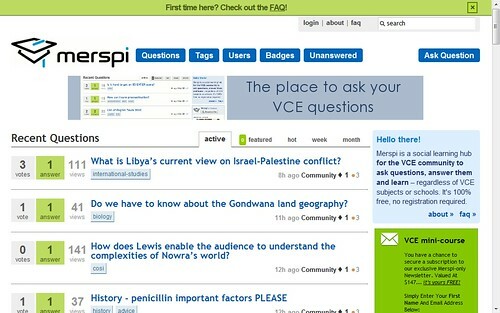 I eventually came up with an idea for an online learning platform for VCE students. It was a kind of Blackboard competitor – online tutoring that schools would buy mashed up with an intranet based collaboration and Web 2.0 philosophies. In other words, the “problems” that people may see in the industry or the market as it currently stands often lend themselves to exceptional business ideas if re-framed as business ideas. This lead to the idea of the online learning platform for VCE students. Over the next twelve weeks, we wrote the business plan and work-shopped the idea with the help of lecturer. We started with a basic idea – online video tutoring for VCE students that schools would buy. Our first test involved talking to some lecturers (experienced mentors) and potential customers of the product. After several months of schmoozing, hard work and rejection on the phone, we managed to get a meeting with a few schools and managed to convince them to give us an hour of their time. After only one or two meetings, we soon realised that our idea was unlikely to ever be something that schools would pay for. OK – what if we could find a way to do it so they didn’t have to pay? We soon realised there were some major problems with each of these sites that we identified. We surveyed some VCE students to find what they thought about the whole thing. The feedback was overwhelming. There was a big demand for information but there was an extreme lack of supply that could be found via Google and similar search engines. However, it was an interesting market because although the demand was high – the students typically didn’t have money to invest in their own education so the large corporations in the market were also struggling. Our first attack at this market according to our business plan was going to be to raise a large amount of money and get the website built for around $100,000. This was far from lean. After a lot of failure at trying to raise six figures worth of capital with no experience and no track-record of success, we gave up. But I was not disheartened. I knew that I could put something together myself… leveraging my own skills. I knew that it would take a lot of time but time was the one resource I had in plentiful supply at that point. A slab of red bull later – we had a working product. Our total costs from idea to implementation ended up being less than a few hundred dollars. The majority of our start-up costs for the three months were spent on SEO, marketing and essentially ‘buying’ the attention of as many VCE students/schools as we could in the hope that the community would grow and catch on in the early bootstrapping days. In the end, our total start-up costs were less than $1,000 and about half of that went towards attending the largest VCE conference that was out there (marketing). We noticed an interesting thing with the Merspi.com launch. We had an impressive amount of traffic practically from Day One. We didn’t start with a list of VCE students or have any great networks in the field. The traffic that hit the site in the early days – the majority spent a very long time on site (over 10 minutes per visitor) and there was a high level of user engagement. You could say this was our first serious test. This was the first time we validated our hypothesis that this was what students were looking for. The validation increased over coming weeks as the traffic grew steadily. We knew that a key metric for the success of our online business was going to be traffic, number of users and the number of questions asked per day. Hence, we set about creating a plan to track these numbers on a daily basis and created short “feedback” loops to improve them. One example: we invested in Search Engine Optimization (SEO) and link-building over a trial period of a week and measured exactly how much extra traffic this caused on the site in order to test our return on investment (ROI) of Marketing Spend vs Increased Traffic. Lesson #6: The faster you can learn in business (Information, Metrics, Customer Information)… The better your chance of success. We used tools such as KISSmetrics, KISSinsights, User Testing and Google Analytics to survey our customers and constantly try to better understand them. We also did the old fashion method of going out and talking to VCE students. In other words – “failure” unto itself in business is not a bad thing. We could have taken the initial meeting with schools all saying no as a sign that we should give up. Instead, we took it as feedback that we should keep the core concept but modify the target market slightly. We integrated the learnings and key complaints from the school target market which was ‘we don’t have any money’ and found a way to deliver the same quality content without having to charge for it to be a sustainable model. There’s a spate of great people coming together and projects happening at the moment that circle around the idea of Mindfulness. I’ve certainly gained a lot of value from studying and practicing being more mindful, albeit sporadically, in the past few years and would encourage others to engage with the topic. One such project is Mindful*, which is a conference being run by Ross Hill and Jan Stewart later this year. You can still buy tickets here, but get in quick. I’m really looking forward to going, and wanted to post about my thoughts on mindfulness. I wanted to share a quick story about one recent moment which helped me further understand what it is all about. A couple of months ago I had the privilege of joining Jan for a coffee and a chat in St Kilda, to discuss what it means to be mindful and also to share in some meditation. She writes a great blog and can often be seen tweeting and #deepdiving, which is what I wanted to find out more about in our chat. The very idea of a deep dive sounded alluring. Over coffee, we discussed my current approach to mindfulness. I had meditated before, but not consistently. Whilst I had a good awareness for moments when I was being unnecessarily distracted or impacted by extrinsic things, I was prone to some intrinsic anxious moments, caused by my own mind wandering away on its own. I’m sure we’ve all had these; moments when that little voice in your head gets carried away, just before hitting the red button. We talked about how, when studying mindfulness, we sometimes get carried away with forcing ourselves to “think of nothing,” which of course defeats the purpose. If you’re focusing on thinking about nothing…are you really thinking about nothing? That was quite a revelation for me. 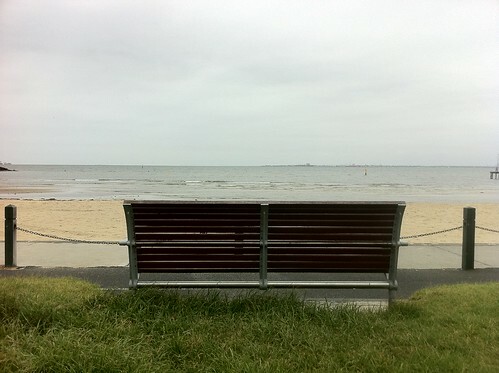 We then moved over the road, to the beach, and simply sat on the bench you see above and meditated for a time. One thing that was hard with sitting on that bench was the number of people that move inn front of you on the bike track, zipping to and fro on their bikes, rollerblades and other conveniences. I found I was being easily distracted (or focused) on the movement happening there. Suddenly, a stiff breeze whipped through. This happenstance alone helped me really grok what it was Jan was talking about over coffee. The wind was something that I was missing, because I was too focused on trying to ignor the bikes. We wear it like a badge of honor. But this ‘bustle’ is actually only helping you miss the obvious. What is it that is right in front of you, right now, that such movement might distract you from. For me on that day, it was the bikes and rollerbladers. In every day life, it may be anything. The wind came through and helped me realize there are things I’m missing, if I’m open to them. And, once open, the experiencing of actually feeling all of those previously unknowns _is_ the experience that meditation is great for. I get a sense that mindfulness is just that. It’s about opening up your awareness to everything that may or may not be in your current consciousness. I’m looking forward to investigating it more at Mindful* and look forward to hopefully seeing you there. Recently, I needed to export a lot of stuff from campfire – about 6 months worth of chats. 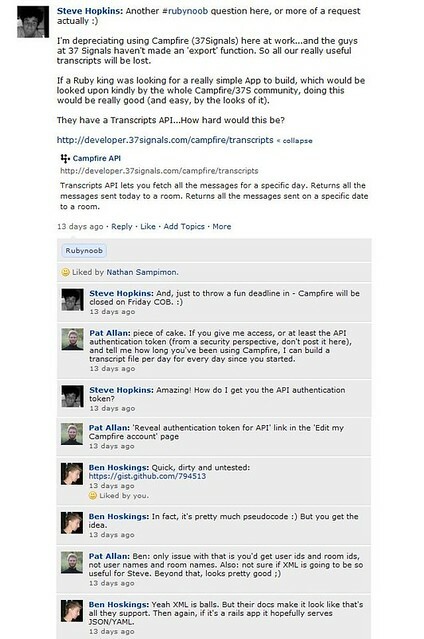 We used Campfire to host our daily huddle chats whilst we were developing an internal product with Pollenizer recently. They decided to depreciate the service, and I was still keen to get the notes from that for posterity. However, I was disappointed to find that Campfire didn’t support a bulk export function, only the ability to download the notes from each days sessions. I had a bit of a hunt around, and luckily found Emil’s response to a different thread post on the Campfire forums. I’ve recently turned my hand to trying to learn and use the programming language, Ruby on Rails. But this was still beyond me, so I headed to the Inspire9 Yammering community and asked there if anyone was able to take up the challenge. The Inspire9 Yammering community contains some of the best Ruby guys in Australia, not to mention some of my best friends, and it’s a good example of what you can achieve using the Yammering system. Whilst we don’t all specifically work for Inspire9, we certainly do all belong in that community. Soon, Pat and Ben had a solution for a script that would export all the info I needed, which you can see here. After all of this, I felt like it was a great opportunity to build the app into something anyone could use, rather than just those blessed with the ability to write Ruby code. So I commissioned Pat to build out the script into an application that would allow someone to export all of their campfire rooms. And now, not even two weeks after the initial question – we have the solution! 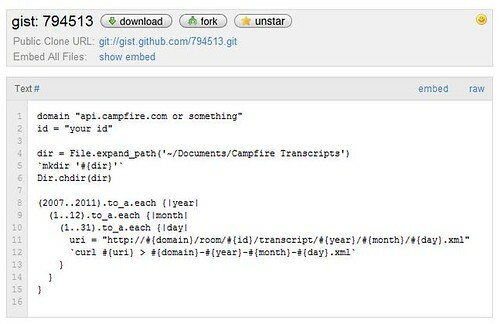 Let me introduce you to http://smo.ulder.in, an app anybody can use to export all their conversations, attachments and knowledge out of a campfire account.